A warm welcome awaits you at the arrival lounge of the Bandaranaike International Airport (BIA), Katunayake. Your designated chauffer guide will give you a brief introduction and commence the trip to Anuradhapura. During afternoon relax and settle into the new surroundings. In the evening take a guided bicycle tour around the local village. Cycling is a popular mode of transport in a village, unlike the bicycles you find at the hotels which looks tougher than the average bicycle. In the morning explore the village at your own pace. There’s much to see and experience in the area. You could take a bath at the nearby lake or take a stroll around the village and mingle with local communities. The afternoon will be utilized for sightseeing tour of the Sacred City of Anuradhapura, the oldest ancient capital of Sri Lanka (4th century BC to 11th century). This is one of the largest archaeological sites in the world and was declared an UNESCO heritage site in 1982. Though time has taken its toll on these magnificent structures, what remain today, clearly show the intricate planning, elaborate constructions and the ornamentation at that time. After breakfast in the morning leave for Dambulla. Upon arrival set on a trek at the Hiriwaduna Village. This trek comprised of a bullock cart ride, a catamaran safari and a typical Sri Lankan lunch at a farmer’s house will demonstrate one’s living condition and their daily routine. 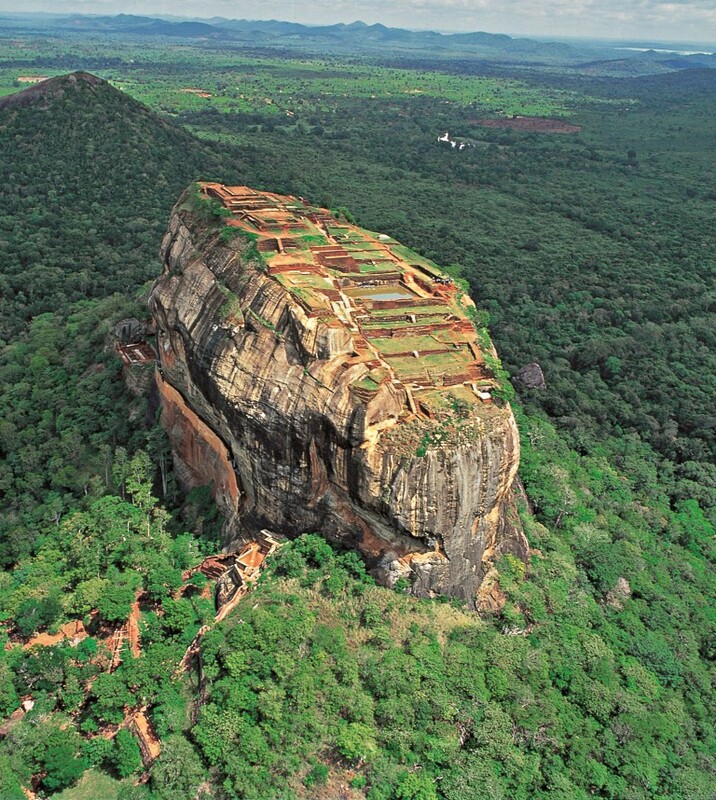 In the afternoon climb the Sigiriya Rock Fortress (Lion’s Rock), one of the most extraordinary artistic complexes of its time (477 – 498 AD). Declared as an UNESCO heritage site in 1982, this magnificent citadel allures artistic and architectural curiosity from around the globe. After breakfast in the morning visit the Dambulla Rock Cave Temple. Also known as the Golden Temple of Dambulla, it was declared an UNESCO heritage site in 1991. 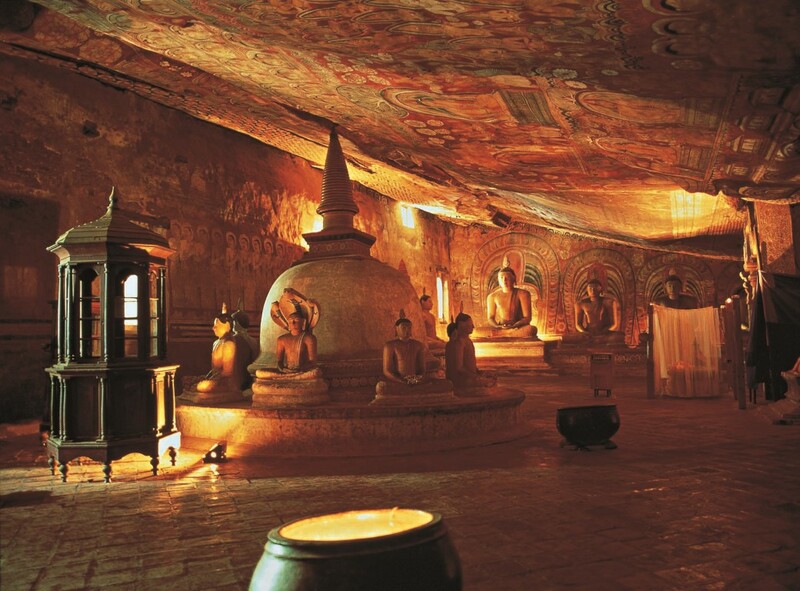 Dating back to the 3rd Century BC, this is the most impressive cave complex in Sri Lanka, five cave-complex covering close to 2100m2 area with extraordinary paintings and 157 statues, is indeed an inspirational masterpiece. There after leave for Kandy. 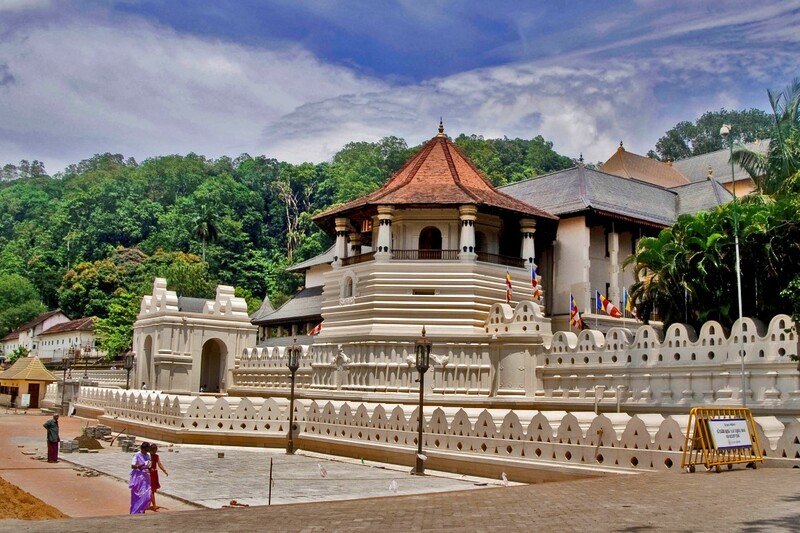 Kandy was declared as an UNESCO heritage site in 1988. The style and character of the Sri Lankan civilization at the time is well articulated in the heart of the city itself, with its lake, the temples including the Temple of the Tooth Relic and the well preserved ruins of the royal palaces. Later in the afternoon saunter around the Kandy Lake, the atmosphere alone will intrigue you to spend a few moments here. In the evening visit the Temple of Tooth, with its guardian elephants is a deeply significant Buddhist site that contains a tooth of Buddha collected from his funeral pyre and this draws thousands of pilgrims from across the world. Hereafter you will have the opportunity to enjoy a typical Kandyan cultural performance. In the morning post breakfast we leave the hotel to visit the Peradeniya Botanical Gardens. Known to be one of the largest botanical gardens in South East Asia, it’s a beautiful and enchanting place to spend a few hours. In the morning leave to Hill Country. You have the option to experience a train ride. A train journey is truly a rare experience and is an adventure itself! Apart from the breathtaking sceneries of the tea country and picturesque waterfalls, it is a chance for you to mingle with the local people. Upon arrival to Hill Country, visit a tea plantation and factory. Here you will enjoy the absolute tea experience, taking you to the moment the young tea leaves are plucked from the plantation to being processed in the factory to make a steamy cup of tea. Take part in some tea plucking, mingle with the locals and share a cup of tea. Early morning around 5.30 am, enjoy a trek at Horton Plains National Park and witness the awe-inspiring view from World’s End. Horton Plains National Park holds great importance due to the rich and unique biodiversity and being a catchment area feeding some of the main rivers of Sri Lanka. It is also know to be a “Super biodiversity hotspot” and thus declared an UNESCO site in 2010. On your trek you will arrive at World’s End, abrupt end, the land plummets straight down 900m, this is just an astonishing view and a somewhat a cool thrill ! 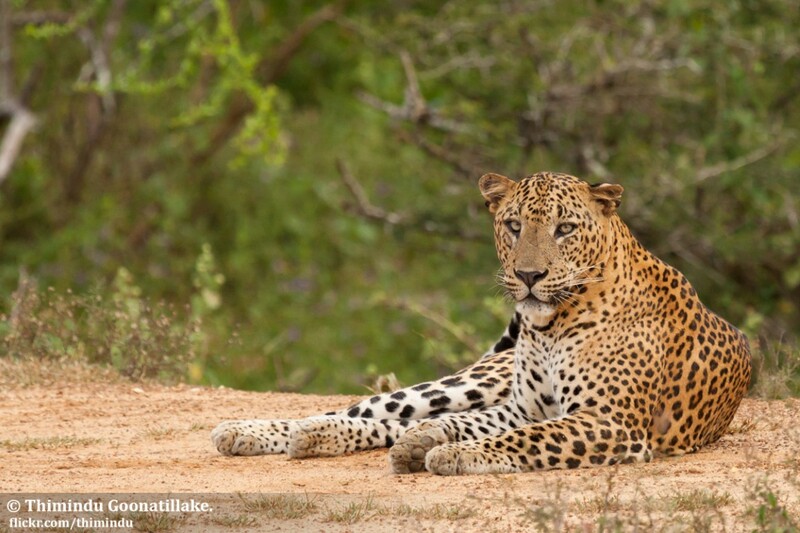 Later travel to Yala National Park. Overnight stay is at the hotel. Start your day with an early morning Lake Tour. Dawn is the perfect time to go out to the lake as the Sun warms up the water. Set on a trek around the local village and take part in a fishing tour. (This trek could be done on bicycle to make it much more fun) Sit out under the tree or on the river bank or help the fisherman cast their nets. Either way you will be treated to a wholesome Lunch beside the river bank with the catch of the day as your main course. Late evening visit the Kataragama Temple and the pooja. Early morning we leave for our last safari at Yala National Park. Return to the hotel and relax till its time for lunch. After lumch we travel along the coastline to Galle/Mirissa. The mesmerizing sceneries of turquoise seas accompanied by the soothing sea breeze will certainly keep you captivated. On your way, make a stop at the Blow Hole in Dikwella. May last for just a moment but it is certainly an exhilarating experience! *If you are in Mirissa during the period of December to April, an early morning whale and dolphin watching safari to the deep blue seas could allow you to see dozens of dolphins swimming amongst Sperm whales and Blue whales. Thereafter take a sightseeing tour of Galle town and its fortifications. This is a city that exudes an essence with a perfect blend of past and present. Declared as an UNESCO heritage site in 1988, the presence of Portuguese, Dutch and English is very evident in the fascinating architectural styles of the Galle Fort. After breakfast in the morning, check out from the hotel and leave for Colombo. At Bandaranaike International Airport (BIA) a Vasco repesentative will assist you for your departure flight back home.